In the 19th century there stood across the fields from Nuneaton town a jumble of grey stones, tumbled down walls and derelict cowsheds. This was the remains of the old Manor House of Nuneaton – Horestone Grange. 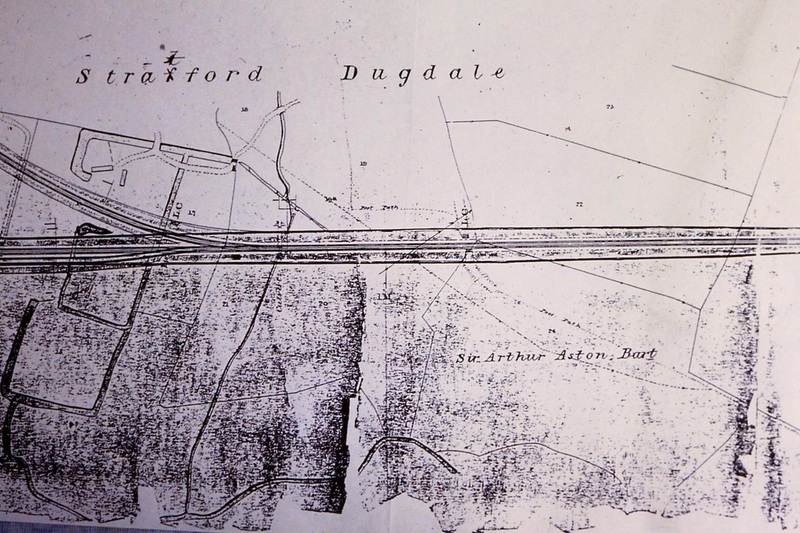 When the Nuneaton to Hinckley railway line was built and opened in 1862 it cut straight through the remains of the grange and the rubble was ploughed into the earthworks of the railway. Its three moats were partially filled in. In later years the outer moats too became filled up, in one case with wagon loads of the remains of old railway company emblazoned china thrown out when grouping of the railways took place in 1923. Before this the remains of the Grange, which had fallen into greater dereliction year by year, stood grey and forbidding in the area of town nearest to it so that what we know today as Wheat Street, Oaston Road (formerly Odd-a-Ways Lane, or Horestone Lane), Regent Street and Bond End. In the 17th century the Stratford family - one of England’s largest landowners and richest families - acquired part of the manor of Nuneaton. John Stratford bought Horestone Grange in 1648. It became his principal seat, but it was not long before he cast his net wider for more real estate to buy. He purchased the Brett’s Hall and Ansley Hall estates which he merged into one, and then Merevale where his descendents through a female marriage remain today – the Dugdale family. After John Stratford moved out of Horestone Grange - probably sometime in the 1670’s - he let it to Charles Beale (? -1699) who used it as a woollen cloth factory. This deal may have been part of the commercial empire of John Stratford’s family who were wool-merchants and dealers in woollen cloth on the London market. Charles Beale was in occupation until his death in 1699 and members of his family today believe that his son, also named Charles, carried on the business during the early years of the 18th century. After this we lose track of Horestone Grange in the written records but it is clear that it was complete and extant until the 1740’s. No occupants are known but the Stratfords still owned the property, and probably their descendents did as late as the 1970’s. Around about the year 1740 a traumatic event happened which for over one hundred years afterwards was remembered by Nuneaton people. Horestone Grange burnt down in a fearful conflagration and one of these Stratford’s, thought to be Edward Stratford (? -1740), according to local folk-lore fell from his horse and died as he rushed back to the Grange from his usual seat in the bar of the Bull Inn (now the George Eliot Hotel). Edward Stratford was a very rich landowner with 26,000 acres of land in Ireland and 8,000 in England believed mostly to be in Warwickshire. His family also owned Stratford House, just off Oxford Street in London. They had business interests in Hamburg, Germany. In fact the Stratfords were said in the 17th century to be the second richest family in England with property and assets even then worth over £1 million pounds which was a staggering amount of money in the 17th century and their earnings from the production of tobacco alone, on their Cotswold estates, was worth £20,000 per annum. By the 18th century their fortunes had waned a bit. Members of the family found themselves on the wrong side of Cromwell after the Civil War and had property confiscated, but somehow the Warwickshire Stratfords managed to stay on the right side. Edward was by all accounts an odd character as his descendent, Gerald Stratford, said his disposition could be assessed by the way he treated his two sons. The oldest was disowned for marrying a Catholic and the second disowned after a fight between him and his father outside of a church. Records in Dublin refer to him as a Colonel in the Militia but he had refused a peerage offered him by King William. He had also fought at the Battle of the Boyne. In Nuneaton Edward Stratford garnered rather a dismal reputation in the eyes of local people. Up until that time the residents of Nuneaton town had right of common on Horestone fields. In other words they could graze their animals there in accordance with some old statute. 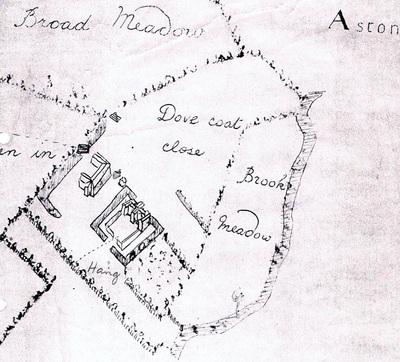 In 1735 Edward Stratford succeeded in enclosing Horestone fields and gave as compensation a parsimonious bit of ground between Weddington Lane and Higham Lane (later known as Cottager’s Piece). This is why the former pub in that area was named The Graziers Arms – i.e. named after the graziers who could graze their animals on Cottager’s Piece. There was another pub there as well known as the “Gardeners Arms” which took its name from those old Nuneatonians who gardened on this common land allotment style. They took their liquid refreshment before staggering home with their sacks of potatoes and cabbages to their court tenement cottages in Nuneaton town. For many years after this the ghost of Lord Hop was seen to manifest himself on anyone daft enough to wander abroad in the unlit winter nights around Horestone Grange. Residents were scared stiff by these hauntings. The Vicar of Nuneaton was called in and asked to put this spirit to rest in an act of exorcism. The tale has it that the ghastly spirit was exorcised into a bottle. The cork pushed in and the bottle was flung into a deep abandoned waterlogged clay pit, which then occupied the corner of Wheat Street and Regent Street (opposite North Warwickshire House). This area at the time was hardly built on. It was much altered when the railway was cut through. In those days there were a number of clay pits and brick kilns along the track of the railway but the earthworks were used to fill them in and the old brick kilns and cottages pulled down. A remnant of one of these old clay pits, a scattered remnant of Hincks brickyard, can be found in the cemetery in Oaston Road where wreaths are laid in a sunken area. In the 1841 census Oaston Road is known as Odd’a’Ways Lane. Who Odd’a’way was I am not sure although it is more than likely a reference to someone who occupied Horestone Grange in the 18th century. Possibly Lord Hop himself or one of his more colourful artisan tenants. Early in the 1800’s one very hot summer, the contents of Lord Hop’s pit almost completely dried out. Someone peering over the edge spotted a mud-covered bottle and extracted it from the pit. Curious to see what it once held and not being familiar with the tale of the exorcism, innocently pulled out the cork. There was a terrifying whooshing sound and once again the apport of Lord Hop was at large in the lanes of the area. It made itself a particular nuisance to the regulars the very old inn, “The Dun Cow”. From that time forward little has been heard of Lord Hop although there is no reason to think he does not appear from time to time on a quiet pitch black night in the fringes of countryside between the Eastern Relief Road and the top of Wheat Street. 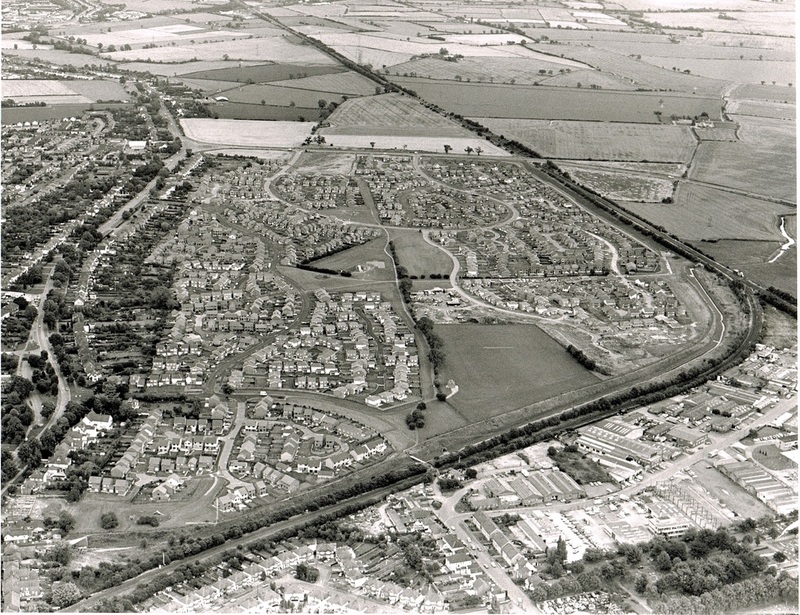 Horestone Grange itself, as a building, is long gone – however the name lives on as a local housing estate is now named after Horestone Grange. This was the original manor house of Nuneaton dating back to the 9th century. It was called Horestone because it was built of "grey stone" from the Attleborough stone quarries nearby. In the 15th century it was owned by the Mallory family one of several estates they had. In 1648 it was purchased by the Stratford family who were then the second wealthiest family in England with huge estates in the Cotswolds, and they were extending their properties into Warwickshire. 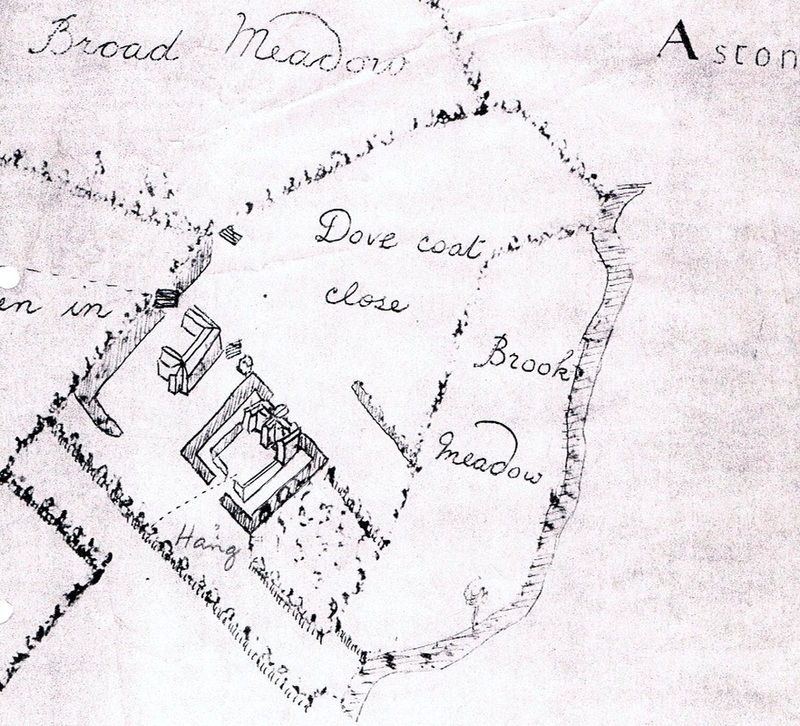 The Stratfords purchased Bretts Hall, Ansley Hall and the Merevale Estate. Horestone continued in their possession until it burnt down in rather mysterious circumstances in the 18th century. 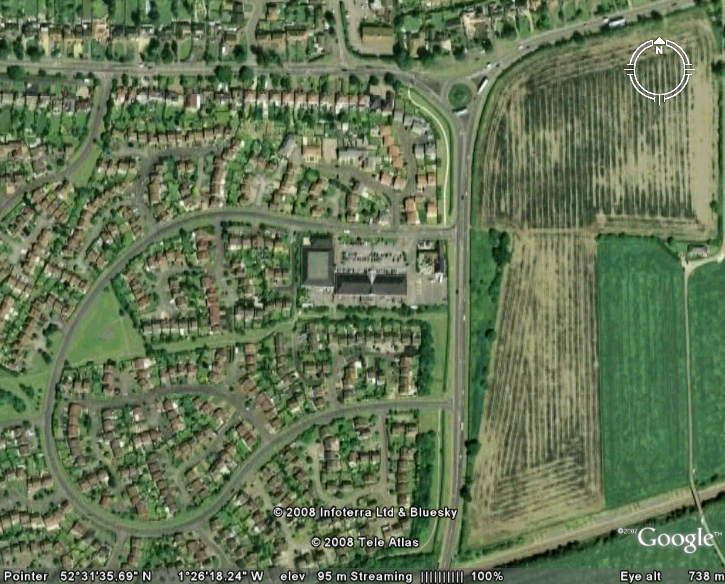 (see Haunted Nuneaton). The Midland Railway completed the demolition when their new line connectiong from Abbey Street to Midland Junction cut through the remains of the derelict grange and the only things left were the moats. The grey stone was robbed out by the local population because cut stone was a valuable commodity in the 18th century used for building new houses and walls in the area. The moats in turn silted up, and after the railways were grouped in 1923 several truck loads of bone china emblazoned with the London & North Western Railway's crest were dumped in one of the moats as the new railway regime cleared out the old station dining rooms. The Stratford's incidentally left Horestone by the late 1680's and it was converted into a woollen mill and tenanted at that time by a Charles Beale. 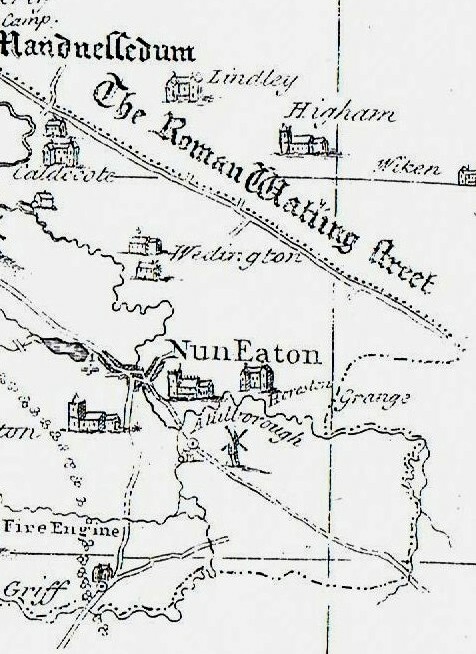 One of these Stratfords, or possibly his tenants was deemed by the local population a bit "odd", and the former name of Wheat Street was "Oddaways Lane" from this perception of the resident of the dark and gloomy old grange across the fields beyond the town. It is perhaps not surprising that there are various old wives tales about Horestone Grange. Whether there is any tincture of truth in them at this distance in time is hard to tell. But in the 19th century when collective memories were a little fresher the tales that surrounded Horestone Grange were very odd indeed. 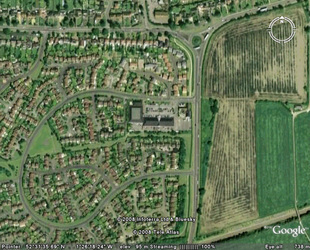 Its all gone now as the former country estate with its ancient grange at the heart is now a housing estate on the outer fringes of Nuneaton. Most people are oblivious to the origins of the name. No sign of the Grange remains above ground, and you are hard pressed to identify the moats these days. Horestone Grange generated a lot of fear and dread amongst Nuneaton townspeople back in the 18th & 19th century, and gave rise to tales of hauntings. It was also said that the Midland Junction signal box which stood at the junction itself and on the top of the old grange was also haunted. Although in this case the ghost was said to be of a former signalman who was forever "on duty" at his post. Although when the loop line in the bottom of the picture was closed the Midland Junction box was removed from the junction and the old signalman is probably mooching around the area with his hands in his pockets for want of something to do. 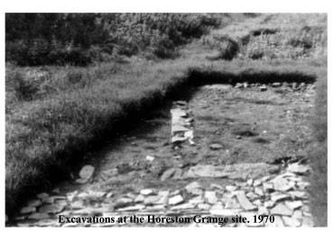 The only known image of the original Horestone Grange. This was the original manor house of Nuneaton dating back to the 9th century. It was called Horestone because it was built of "grey stone" from the Attleborough stone quarries nearby. 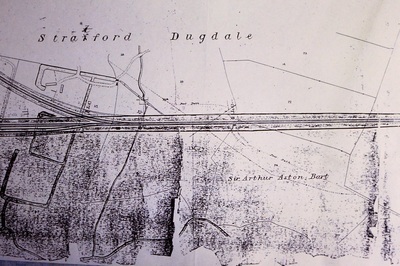 The official London & North Western Railway track plan and section shows the configuration of the railway lines as they swept through the remains of Horestone Grange in 1864. The complex moat system is well illustrated in this view and it can be seen that the main house was thoroughly destroyed by the time the railway was completed. 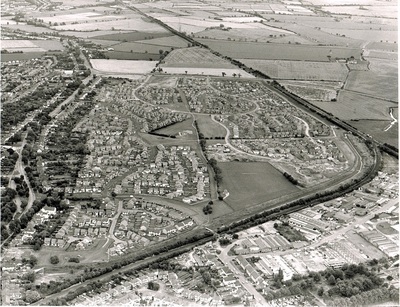 Horestone Grange from the air. 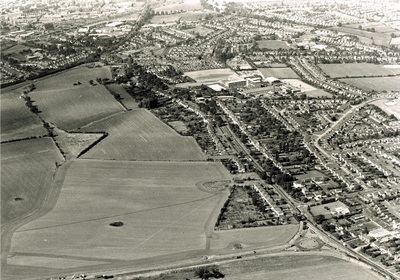 Before Horestone Grange estate was built. The site of the manor house is off the picture to the left.